Tripoli Council Mayor Abdelrauf Beitelmal lays the foundation stone for the multi-storey car park project in Dahra (Photo: Tripoli Council). 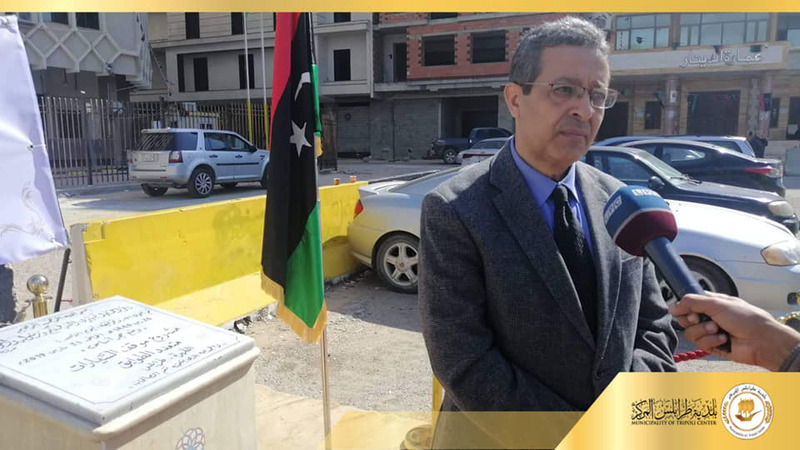 The mayor of Central Tripoli Council, Abdelrauf Beitelmal, laid the foundation stone yesterday for the new multi-storey car park in the Dahra district of central Tripoli. The council reported that his comes after four years of its efforts and attempts to implement a multi-storey car park project in central Tripoli. The car park will be built by the state/private company, the National Investment Company (NIC). The council says the NIC won the contract after a tender process was conducted by the State Property Authority, the owners of the land. Tripoli Council hopes that the car park will contribute to alleviating part of the congestion in the Dahra area. It will be recalled that an NIC subsidiary recently won the contract to supply Tripoli with buses from China. The NIC is a curious private / state holding company that owns a number of subsidiaries. It was formed by the Qaddafi regime in 1986 by forcibly deducting 1.5 percent from the salary of every Libyan to form the company with a capital of LD 1.2 billion. Its management structure is still disputed by some of its shareholders and a comprehensive list of shareholders has been difficult to establish.